Sugar cookies are some of my favourite cookies ever. These are truly melt-in-the-mouth and despite their sometimes overwhelming sweetness, something about them keeps me reaching over for another. Dammit. This version is super easy to make, to bake and of course, to eat. It might melt a little crazy and turn into a cookie monster (but who cares, you now have a gigantic cookie! That can’t be a bad thing). But they always taste good, whether freshly baked or a few days later. Put simply, this recipe has a bit too much butter for my liking. I like my sugar cookies a little more sturdy. But these do make great chewy versions. They still melt in your mouth. And their damned easy. I’m still sold. I got a little experimental. Originally, with my sturdier sugar cookies in mind, I had wanted to frost them with glacé icing, and then add flower petals that I’d collected from our little patch of edible flowers growing steadily in the garden. As I realised with the first patch that I could kiss those ideas goodbye, I decided to forgo the traditional sugar rolling process for a few of the cookies, and instead use lavender sugar. I’ve given you both recipes below (they’re pretty much the same, just different sugars), and I hope you like them just as much as I do! makes about 15 cookies, depending on your chosen spoon size. Preheat oven to 170 degrees C. Line baking trays with baking paper/parchment paper. Cream the butter and sugar together for about three to four minutes, until well combined, and pale and fluffy. Add the egg, and continue to mix until all is combined. Slowly add your flour mix, letting it all combine thoroughly gradually. Once mixed together, add the vanilla. Now, take a teaspoon of dough and roll it into a ball with your hands. Roll it in your chosen sugar, and set it on the tray. Flatten the dough with the palm of your hand. Repeat with the rest of the dough, letting the cookies sit about two inches apart from each other on the baking tray. Bake for about 10-12 minutes until light gold and browning at the edges. Carefully move the parchment paper and the cookies onto a wire rack to cool down a little better. They will harden the more they cool down. They keep fairly well for a few days when stored in a sealed container, but otherwise, they’re delicious as soon as they’re out the oven (but cooled just a little)! I’ve kept mine for a few months now, and it smells delicious but you can still make this on the day you want to make your cookies, it just won’t make the sugar itself smell as lovely! 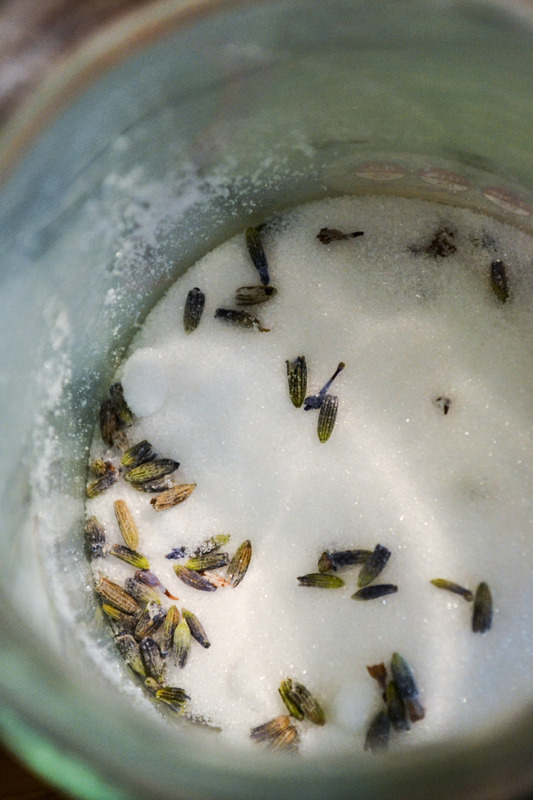 🙂 I really recommend making some lavender sugar to have around, it’s great as an alternative for plain sugar on pancakes!